"The Kraken" is the brainchild of a two-year-old Palermo-based arts association called Lemosche (The Flies). Gaetano Costa, one of the group's founders, wrote and directed it; other company members designed the set and the video projections while John Turturro provided recorded narration. 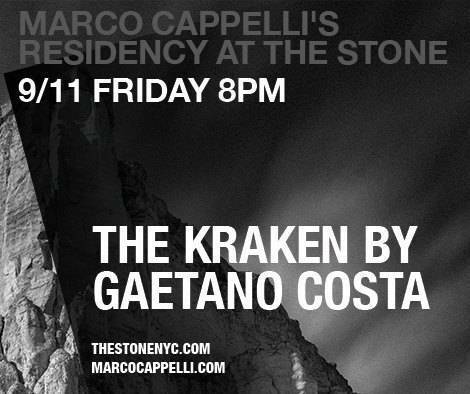 The music was by guitarist and composer Marco Cappelli, who collaborated with Lemosche as part of his weeklong residency at the Stone in celebration of his fiftieth birthday. Cappelli, a venturesome and versatile musician born in Naples, has been involved with a wide range of projects since coming to New York City in the '90s. He plays classical and contemporary music, improvises and works with written scores, leads his own groups and collaborates with a diverse group of composers and musicians. He currently leads three bands, the Marco Cappelli Acoustic Trio, Italian Surf Academy and IDR–Italian DOC Remix. As a side musician, he plays with fellow guitarist Marc Ribot's band Caged Funk and composer Adam Rudolph’s Go: Organic Orchestra. Besides all that, he teaches at Columbia University and at the Conservatorio Vincenzo Bellini in Palermo. It was at the Palermo conservatory that Cappelli met the members of Lemosche.